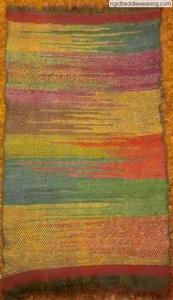 Getting thrilled about plain weave can be summed up in one word: Saori. 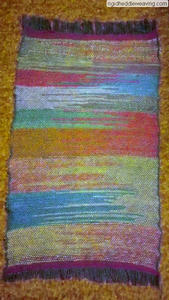 Saori is a free form style of weaving with a "from the heart" philosophy. It was founded in 1968 by Misao Jo, a Japanese woman. 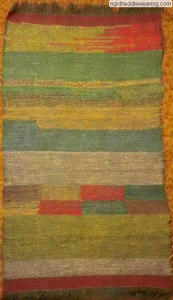 This style of weaving is practiced in over 40 countries today. What I love the most about it is that there's simply no mistakes and no rules, other than to just let your spirit go free and do whatever seems like a really good idea at the time. It always works out, too! I'm currently in the process of making rugs. 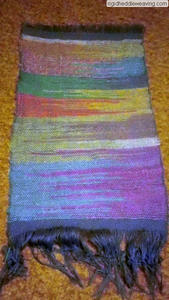 I'm using a clasp weft technique in a random fashion on my floor loom to make these rugs (not recommended for the rigid heddle loom) using 2 shafts to produce the plain weave. Here I am using Churro-Navajo (or Navajo-Churro as I've seen it being referred to both ways) that I processed from a fleece along with a wool carpet warp of unknown breed. I've made towels with this technique and I've seen many examples of cloth made this way that turned out fantastic (which you can weave with your rigid heddle loom). Some ideas are things like towels, placemats, table cloths, table runners, curtains, pillow covers, bed spreads, clothing, fashion accessories, tapestries, curtains, window valances, etc. You don't have to do clasp weft for Saori. You can use whatever materials and colors that make you happy. Here's an excellent video showing how to weave Saori with the Clasp Weft Technique. Now, go have fun!